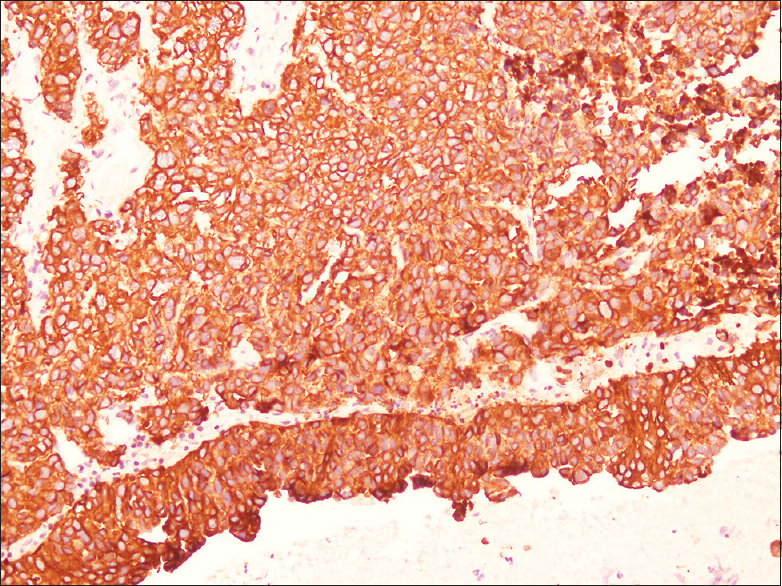 Bladder carcinoma is a relatively rare carcinoma reported in renal allograft recipients. While many oncogenic viruses have been implicated as causative factors for certain malignancies, questions have been raised about possible role of BK virus in pathogenesis of urothelial cancers. In this report, we have described a patient who developed BK virus nephropathy followed 3 years later by bladder carcinoma. Interestingly, while the tumor tissue demonstrated BK virus, the adjacent normal urothelium was stained negative for BK virus. Considering the viral potential to inhibit tumor suppressors and its differential localization within tumor tissue, it is possible that the virus contributes to tumorigenesis. Renal transplant recipients are at risk from opportunistic infections and occasionally their oncologic manifestations. We report on a renal allograft recipient developing a high-grade urothelial carcinoma with BK virus (BKV) nephropathy 2 years before the detection of the malignancy. BKV was demonstrated in urine, blood, and tumor tissue, suggesting a strong association and possible oncogenicity. A 59-year-old female, with end-stage renal disease from hypertension with no prior history of nonsteroidal anti-inflammatory drug intake, received living-related kidney transplantation from her maternal cousin in May 2012. She received induction therapy with three doses of thymoglobulin at 0.9 mg/kg and tacrolimus, mycophenolate mofetil along with prednisolone. She received cytomegalovirus prophylaxis with valganciclovir for 3 months and trimethoprim-sulfamethoxazole for 1 year. The initial 2 years were uneventful except for an episode of diarrhea in March 2014 when serum creatinine peaked to 2.34 mg/dl. Investigations for diarrhea were inconclusive. She received parenteral fluids and antibiotics and recovered with serum creatinine of 1.42 mg/dl. In August 2014, when creatinine increased to 2.1 mg/dl, urine examination revealed trace proteinuria, 1–5 red cells, and some epithelial cells per high-power field and renal histology showed the presence of ground glass intranuclear inclusions within the lining of tubular epithelial cells along with a moderately dense lymphoplasmacytic infiltrate in the interstitium [Figure 1] and [Figure 2]. Immunohistochemistry revealed SV-40 antigen in tubular epithelial cells. BKV DNA was identified in the serum – 2,784,000 copies/ml (Artus BKV RG PCR Kit: QIAGEN GmbH, Germany). In view of BKV nephropathy, mycophenolate mofetil was changed to azathioprine 50 mg once daily, and dose of tacrolimus was reduced targeting a trough <4.0 ng/ml. Prednisolone was continued at the dose of 5 mg/day. Her serum creatinine ranged from 1.6 to 1.9 mg/dl on follow-up. In October 2017, she developed pain and hematuria on micturition with clots. She reported loss of appetite and a 4 kg weight loss over 3 months. 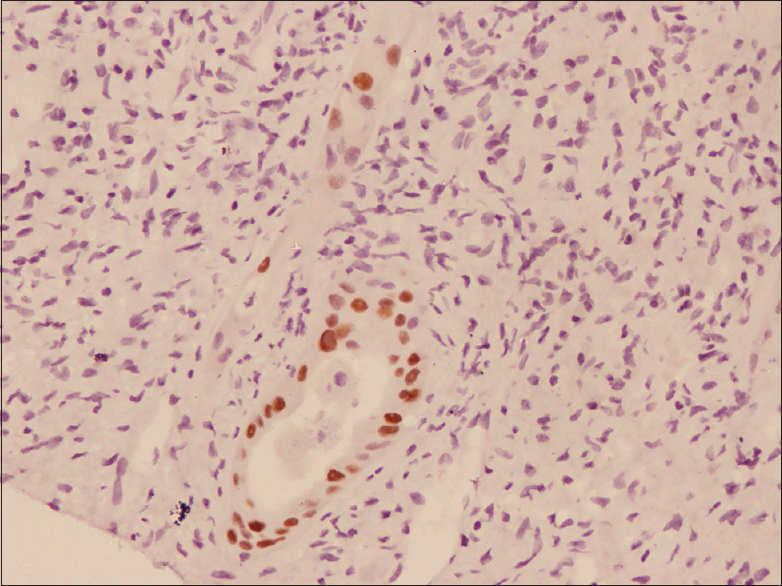 Examination of urine under high power revealed numerous red cells; decoy cells were not identified with Papanicolaou stains. Ultrasonography revealed two irregular mass lesions – in the anterior and lateral walls of bladder, respectively. 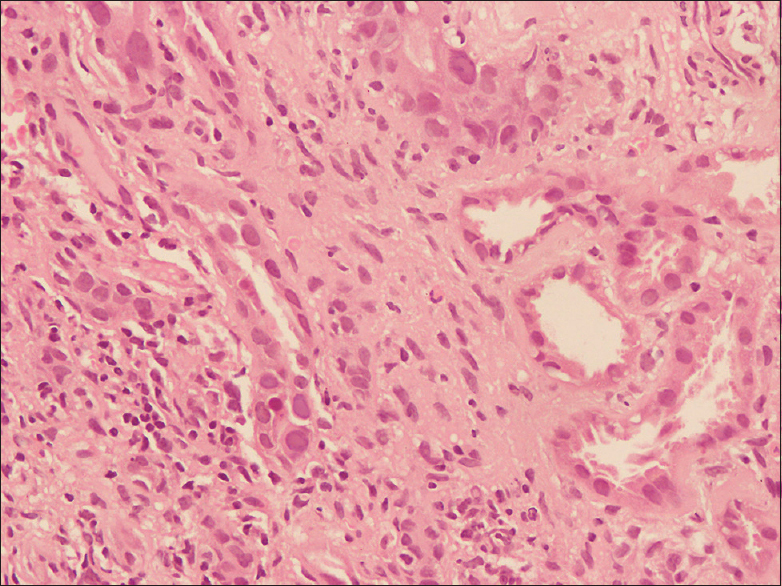 Cystoscopic bladder biopsy showed a high-grade papillary urothelial carcinoma. Immunohistochemistry confirmed positivity for CK7 and GATA-3 and focal positivity for uroplakin [Figure 3], [Figure 4], [Figure 5]. 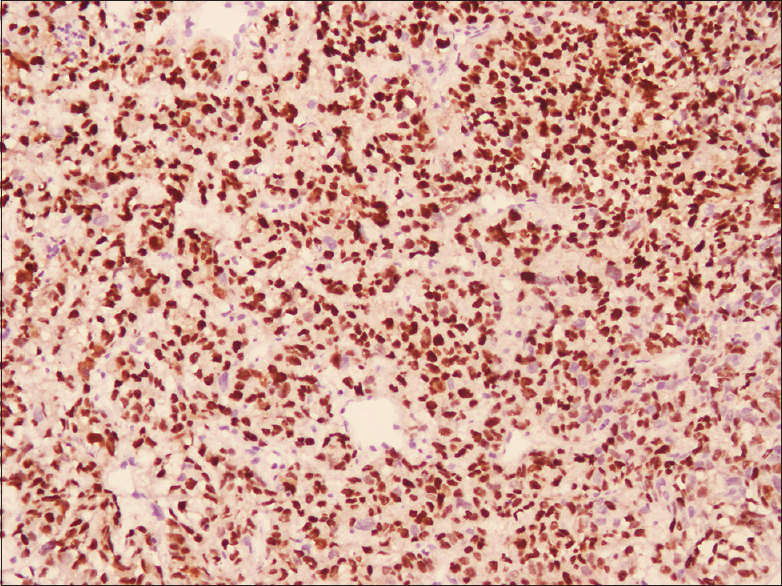 Tumor cells stained positive for SV-40 [Figure 6]. Interestingly, at this time, serum polymerase chain reaction for BKV DNA revealed just 340 copies/ml. Magnetic resonance imaging (MRI) showed deposits encasing the distal right ureter, abutting the vaginal vault along with evidence of adherence to the small bowel loops. Fluorodeoxyglucose (FDG) positron emission tomography (PET) scan revealed FDG avid uptake lesions seen on MRI with no evidence of metastasis. In view of patient's frailty and locally invasive disease, she was treated with 54 Gy of three-dimensional conformal radiation therapy fractionated to 1.8 Gy per session, 5 days weekly for 6 weeks. Tacrolimus was switched to everolimus, while prednisolone was continued. A second FDG-PET showed modest reduction in uptake compared to previous scans with no evidence of distant metastases. The serum creatinine remains around 2.3 mg/dl at the last follow-up. The BKV (BK polyomavirus [BKV]) was first isolated in 1971, by Gardner et al., after inoculation of Vero cells with urine samples from a 39-year-old Sudanese renal allograft recipient with the initials B. K. Primary infection by BKV is usually in apparent and occasionally be accompanied by a mild respiratory illness or urinary tract symptoms. During the primary infection, when mild respiratory or urinary symptoms may manifest, viremia occurs when latency in organs is established. Immunological impairment leads to reactivation. Virus isolation and Southern blot hybridization analysis have established that kidney is the main site of BKV latency in healthy individuals. However, BKV has also been detected in the liver, stomach, lungs, parathyroid glands, tonsils, and lymph nodes. Transmission may occur via oral, respiratory, or transplacental routes. The BKV genome is a closed, circular 5 KB double-stranded DNA molecule that replicates bidirectionally from a unique origin. The early genes encode the large tumor antigen (TAg), the small tumor antigens (tAg), and the truncated TAg that are expressed by alternatively spliced mRNAs soon after infection of the host cell. The main property of Tag in relation to transformation and oncogenicity is its ability to bind and block the functions of tumor suppressor proteins p53 and pRB family. McCabe demonstrated that in the cells lacking retinoblastoma gene, DNA methyltransferase 1 (DNMT1) is activated, which in turn is associated with tumor suppressor gene hypermethylation culminating in tumorigenesis. The same group demonstrated that DNMT1 is strongly activated by BKV Tag. 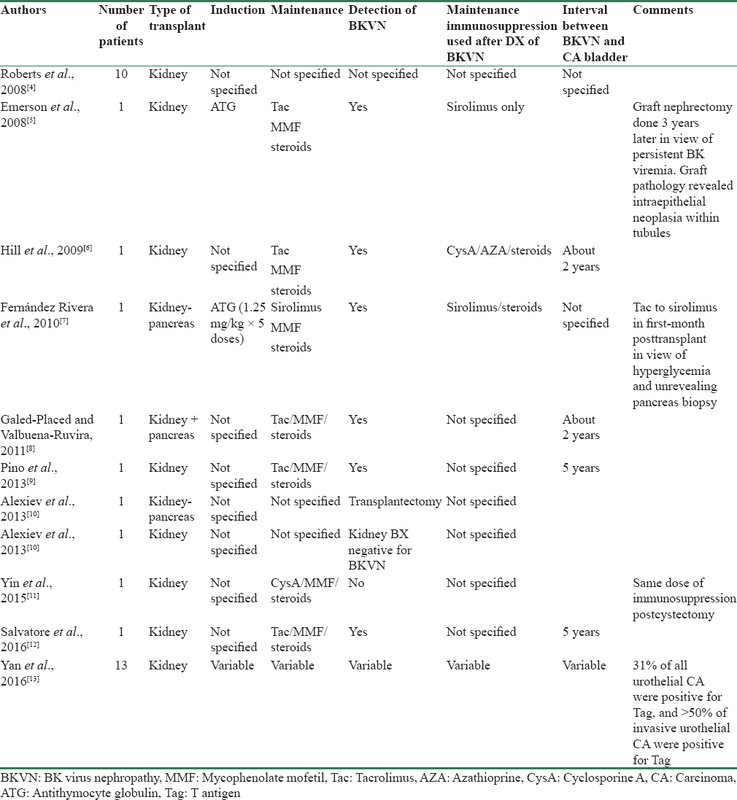 Many cases of high-grade urothelial carcinoma occurring in patients with prior BKV nephropathy have been described demonstrating the occurrence; duration between the events ranging from a few months to as long as 5 years [Table 1]. In many of these cases, the nature of induction and maintenance immunosuppression is unclear. In this patient, thymoglobulin was used at a lower dose and duration, and the other immunosuppressants too, dosed at a standard range. BK viremia was far lower at the time the malignancy was detected. A declining viremia which may be seen following reduction of immunosuppression may not be predictive of reduction of risk of malignancy in all cases. A protocolized monitoring for BK viremia while reducing the risk of BK nephropathy may avert downstream oncogenicity as well when early reduction in immunosuppression is attempted to thwart viral replication. Helle F, Brochot E, Handala L, Martin E, Castelain S, Francois C, et al. Biology of the BKPyV: An update. Viruses 2017;9. pii: E327. Tognon M, Corallini A, Martini F, Negrini M, Barbanti-Brodano G. Oncogenic transformation by BK virus and association with human tumors. Oncogene 2003;22:5192-200. McCabe MT, Low JA, Imperiale MJ, Day ML. Human polyomavirus BKV transcriptionally activates DNA methyltransferase 1 through the pRb/E2F pathway. Oncogene 2006;25:2727-35. Roberts IS, Besarani D, Mason P, Turner G, Friend PJ, Newton R, et al. Polyoma virus infection and urothelial carcinoma of the bladder following renal transplantation. Br J Cancer 2008;99:1383-6. Emerson LL, Carney HM, Layfield LJ, Sherbotie JR. Collecting duct carcinoma arising in association with BK nephropathy post-transplantation in a pediatric patient. 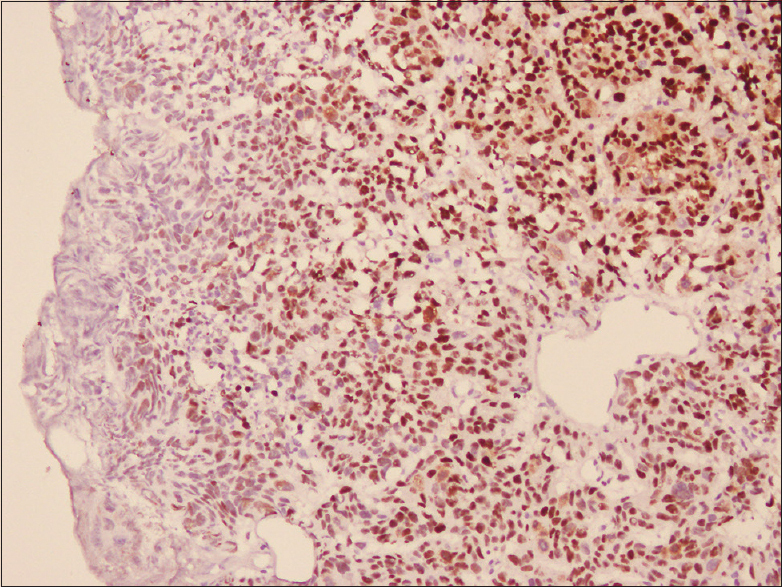 A case report with immunohistochemical and in situ hybridization study. Pediatr Transplant 2008;12:600-5. Hill P, Slavin J, Goodman D. High-grade urothelial carcinoma in a kidney transplant recipient with BK virus infection. NDT Plus 2009;2:246-9. Fernández Rivera C, Alonso Hernández Á, Mosquera Reboredo J, Rodríguez Gómez I. Association of bladder adenocarcinoma and BK virus infection in a pancreatico-renal transplant recipient. NDT Plus 2010;3:300-2. Galed-Placed I, Valbuena-Ruvira L. Decoy cells and malignant cells coexisting in the urine from a transplant recipient with BK virus nephropathy and bladder adenocarcinoma. Diagn Cytopathol 2011;39:933-7. Pino L, Rijo E, Nohales G, Frances A, Ubre A, Arango O, et al. 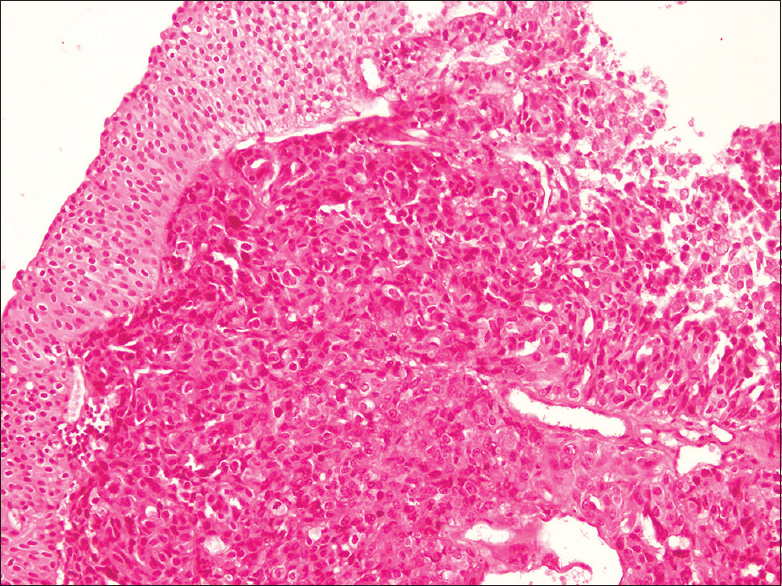 Bladder transitional cell carcinoma and BK virus in a young kidney transplant recipient. Transpl Infect Dis 2013;15:E25-7. Alexiev BA, Randhawa P, Vazquez Martul E, Zeng G, Luo C, Ramos E, et al. BK virus-associated urinary bladder carcinoma in transplant recipients: Report of 2 cases, review of the literature, and proposed pathogenetic model. Hum Pathol 2013;44:908-17. Yin WY, Lee MC, Lai NS, Lu MC. BK virus as a potential oncovirus for bladder cancer in a renal transplant patient. J Formos Med Assoc 2015;114:373-4. Salvatore SP, Myers-Gurevitch PM, Chu S, Robinson BD, Dadhania D, Seshan SV, et al. Polyoma (BK) virus associated urothelial carcinoma originating within a renal allograft five years following resolution of polyoma virus nephropathy. Clin Nephrol 2016;85:179-83. Yan L, Salama ME, Lanciault C, Matsumura L, Troxell ML. Polyomavirus large T antigen is prevalent in urothelial carcinoma post-kidney transplant. Hum Pathol 2016;48:122-31.